Dr. Trudeau strongly recommends a thorough dental examination for presence of tooth and gum infection is recommended prior to joint replacement. Because of the lack of any discomfort to the patient until total loss of bony support to the teeth, many adults are unaware that they have this infection until they visit Dale Trudeau DDS. However, the bacteria from this bone destroying disease, especially in the more advanced cases, has been attributed to possible infection of joint replacements. Candidates for joint replacements who have not been seen by Dr. Trudeau in over a year should consider a thorough dental evaluation of their teeth and gums before surgery. 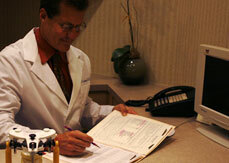 If you have any questions about infection in joint replacements, please call our office at (858) 755-9775.